Organizations overwhelmingly want to handle data faster, but are falling short. New survey from Dimensional Research and Streamlio takes a closer look at why. 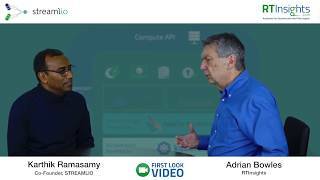 Adrian Bowles from RTInsights discusses the market evolution driving the need for a new approach and new technology to handle fast-moving data with Streamlio's Karthik Ramasamy. What is the Streamlio platform? Today's data-driven applications need to handle data as it arrives, not wait for it to traverse a slow, complex data pipeline. Streamlio delivers an enterprise-class solution for fast data so that you can act on data in real-time. Streamlio enables enterprises to understand and act on data in real time, enabling diverse new data-driven applications. Deliver always-up-to-date information and insights including current trends, live dashboards, real-time model processing. Cleanse, filter, enrich and aggregate data as it arrives, without complex batch processing pipelines, to provide always-up-to-date data to data scientists, analytics users, and applications. Connect, process, and analyze data streaming from connected sensors, devices, and systems to provide timely insights and automated actions. Rather than only discovering fraud after it happens, use real-time processing to assess transactions at the time of transaction, avoiding the costs and risks of fraud. React and respond to customers with tailored information and offers based on their current interests and behaviors. Detect and block attacks and intrusions in real-time through inspection and analysis of data from devices and interactions. Streamlio's Karthik Ramasamy explains the role of data in connecting microservices and the technology needed to do that. Industry analyst firm Bloor took a closer look at Streamlio's technology and vision. They summarize their findings in this InBrief.